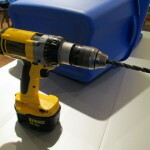 Home » Bringing the garden inside » DIY Project ~ Vermicomposting in a tub in a few easy steps! 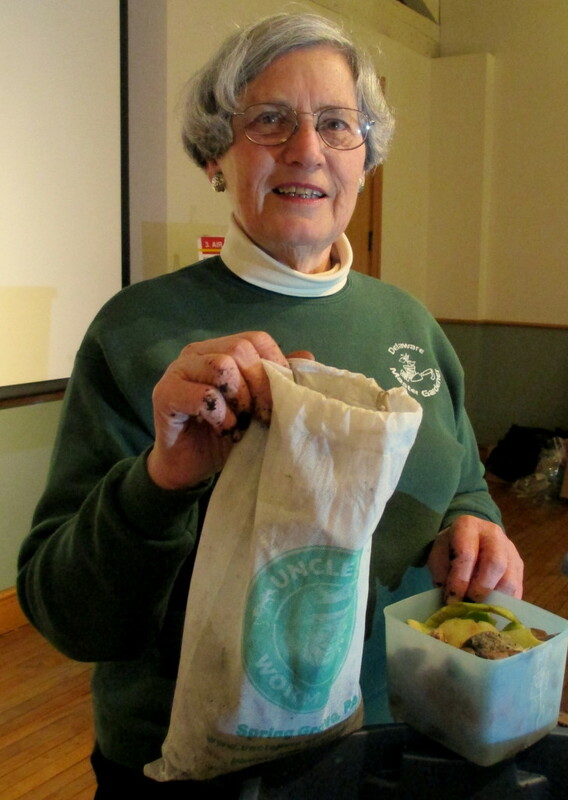 Hetty Franke, Master Gardener and “Queen of Compost in Delaware” recently held a workshop at TheDCH. Teaching all ages, from school children to senior citizens, Hetty’s mission for many years has been to make people aware that plant matter is also a resource, not trash. Composting of all kinds was discussed: aerobic composting (compost pile or container), anaerobic (digging a trench and filling it in) and vermicomposting (worm composting). Here’s a brief overview. 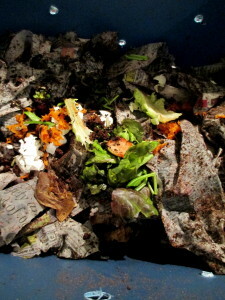 Aerobic composting in bins or piles requires aeration for decomposition. This requires turning to keep oxygen levels up for the decomposing microorganisms breaking down the plant matter. Layering of Nitrogen (Green) matter such as kitchen scraps, manure and other green plant material with Carbon (Brown) matter such as shredded leaves, straw, paper and wood chips keep the mix from getting slimy and smelly. But aerobic composting isn’t efficient when you’re continually adding new material to the pile. A pile must have time to decompose, so therefore, it is better to have an active pile and one that is left alone except to aerate it. This requires space, and, in some areas, is not allowed, so check what the regulations in your area are first! 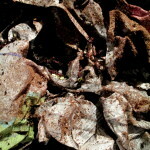 Anaerobic composting is simply digging a hole or trench and filling it with the plant matter, then filling it back in. This can be done under bushes and in flowerbeds in small yards. It is a method I used in my last very small space garden. It does not require oxygen, although it is a slower method of decomposition than aerobic composting. 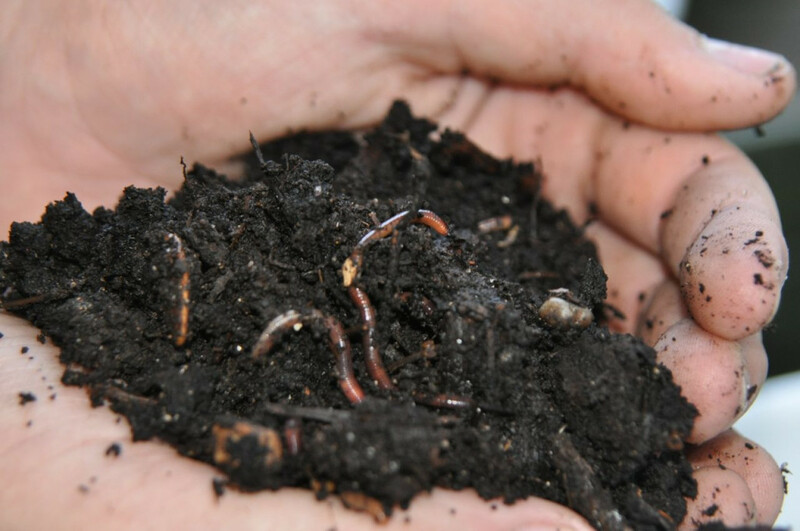 Follow the easy steps below to set up your own worm bin and begin vermicomposting at home. You will keep plant matter out of the landfill and have the benefits of compost and compost tea for your plants, worms for feeding birds and pet reptiles and going fishing, too! Materials needed: one plastic storage tub and cover, a shallow tray for underneath and two blocks of wood or bricks to set it on,an electric drill with two bits (one large, one small), a few handfuls of peat moss or garden soil, newspaper, worms and kitchen scraps. Here’s the link to the University of Delaware’s Cooperative Extension Service site on composting and frequently asked questions. Step 6 ~ Put the tray on the floor, add the two bricks and set the tub on top. Keep the lid on and keep moisture consistent. Then enjoy the compost! Will do, Bob! Thanks for stopping by today! We’ve been researching to do this for the last year. I’d love to get started this spring. Our compost bin is open so when we add anything from the kitchen, the chickens are on it right away. This would be a great way to use the scraps. And wonderful for the gardens! Debbie ~ this is a pretty handy way to dispose of kitchen scraps. 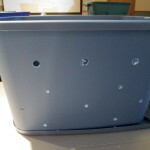 For outside (if you have a lot of scraps) try using a trashcan with holes drilled in it and do the same thing! Happy recycling! Thanks so much for posting this! I just recently got interested in composting with worms, this is perfect timing! How many worms would I need for the same size bin shown in the picture? Hi, Audrey! You are all signed up! Thanks so much for stopping by. 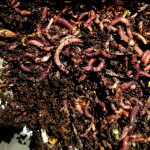 There is a link for Uncle Jim’s Worm Farm on the bottom of the blog post.But to save time, here it is again http://unclejimswormfarm.com/ You can order on-line and their website has tons of info on vermicomposting too. Happy Vermicomposting! Hi! I love the information. Could you add me to your list for updates? I have a small vegetable garden and I think I’m going to add vermicomposting to my hobbies. Once your worms have gotten a good start on the compost and I want to use it in my garden, do I add it to my garden with the worms? Or do I sift out the worms? How do I know if there are too many worms? This looks great and I want to give it a try. 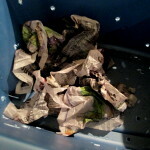 Pam, when you are ready to harvest your compost, wedge a piece of cardboard down the middle of the tub, leaving a little space at the bottom for the worms to move. Then feed only on one side for a week or so. Most will migrate over where the food is. 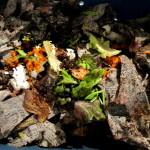 Check out http://unclejimswormfarm.com/ this link for many more facts and ideas as you begin worm composting. They are way more expert than I am as they are the worm source! Happy Composting! Barb, Thank You so much for the information. I use to have a large garden & compost but have moved to a studio apartment. Have only 2 flower beds that I garden in now. I’m not able to do the things I use to now with my fibromyalgia. But still have to getmy hands in the dirt. lol. Please add me to your e-mail list. Thank you again! Thanks so much for writing, Michelle! We all can make an impact in this world by planting and recycling. The scale is not the important thing, it all makes a difference. Just think if EVERYONE did just a little!! Not to mention the joy and contentment we derive from being connected to our earth.So glad that you enjoyed the vermicomposting post and hope you are able to give it a try. I’ve added you as a subscriber too, many thanks!